This week in the war, on 16 February 1943, the law concerning the Service du travail obligatoire (STO)—the compulsory labour service law—was put into action by the government of Vichy France. It applied to young French males born between 1920 and 1922 and required them to move to Germany to work in factories. 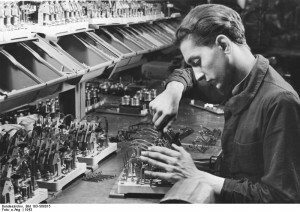 The photograph to the left shows a Frenchman gainfully employed at a Siemens factory and was likely taken by the Nazis and distributed in France to encourage compliance with the new law. The law was unpopular with the French and even with the German administration in France. The latter saw it as competing with their own needs to recruit French workers to help the German war effort by working in munitions factories in France. The Todt Organization was also attempting to hire French workers to build coastal defenses, notably Hitler’s so-called Atlantic Wall. 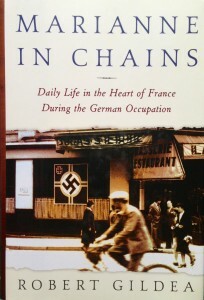 Robert Gildea’s book, Marianne in Chains, discusses the STO in detail. He describes how the German authorities in France protected French factory workers from STO recruiters and how even German armaments minister, Albert Speer, believed it would be more useful to have French workers continue working in German factories in France. There was much corruption in the administration of the STO, and many exemptions. The exemption granted to university students was done away with by the summer of 1943, by which time French police had started raiding cafés to check the papers of young men in case they were avoiding the STO. On 1 February 1944, which was nearing the close of the German occupation, the labour service law was broadened to include the registration of men between 16 and 60 years of age and, for the first time, the law included women (aged 18 to 45). This entry was posted in Book and tagged Marianne in Chains, Robert Gildea, Service du travail obligatoire, STO, Todt Organisation, Todt Organization, Vichy. Bookmark the permalink.